. :: Len's Ace - About us ::. 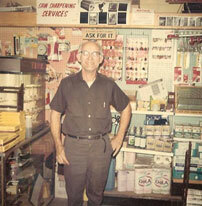 Len's Ace Hardware is a family owned and operated business that's been serving the community for over 50 years!! Len's Ace Hardware was founded by Len and Mary Grimsley in 1959. 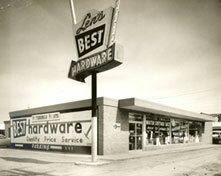 It was known as Len's Best Hardware and operated under that name until 1962. Len then changed affiliations to Ace Hardware and was the 426th Ace store to open. In 1970 Len Jr. took over daily operations. Under his management, the business continued to grow and the store along with it. Since then, the Addison store has undergone numerous additions and renovations. It offers a full rental department, a small engine repair shop and a seasonal green house. It is currently one of the largest Ace retailers in Illinois. In 1990 Len III, took a more active role in store management. With Father and Son working together and the business doing so well, the Grimsley family decided it was time to expand. In 1997 they purchased and converted a True Value store in Roselle. In addition to a name change, the location underwent a complete remodel and expansion. It currently offers a full rental department and propane filling station. 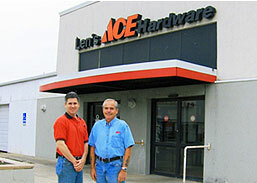 In 2000, Len's Ace opened their third location when they purchased an existing Ace Hardware in Glen Ellyn. The store has since undergone extensive renovations and continues to thrive. In 2005, Len's built their second largest store in Bloomingdale. It was the 11884th Ace store to open world wide and quickly became a one stop destination for contractors and do-it-yourselfers alike. Today, Len's Ace Hardware is third generation owned and operated. It is one of the most successful Ace chains in the Chicagoland Area and offers a complete selection of quality products, services and a knowledgeable sales staff.